You'll notice straightaway--and it's been so for all my previous entries about the main event--I'm not posting an image of the regular cover, but rather the 1-in-25 "incentive" variant edition. That means that retailers had to order 25 copies of the "regular" edition to be eligible to order even one of these puppies. For earlier issues, there were also 1-in-75 variant editions. In one case, Marvel only made a "special" variant available to retailers who ripped the covers off 50 first printings of comics tied to competitor DC Comics' FlashPoint event and sent them in. 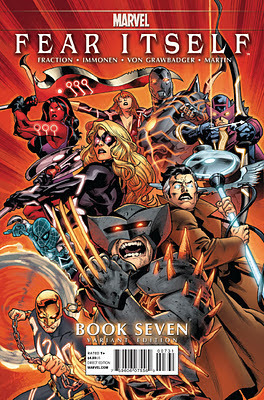 The variant covers are but one part of Marvel's perennial sales strategy. To hear retailers tell it, the variants are "gifts" from Marvel for inflating their sales numbers. They're supposed to sell them for inflated prices, to make up for the lack of higher discounts from distributor Diamond. A 1-in-25 book should sell at retail for $25USD, as would a 1-in-50 book retail for $50USD, etc. 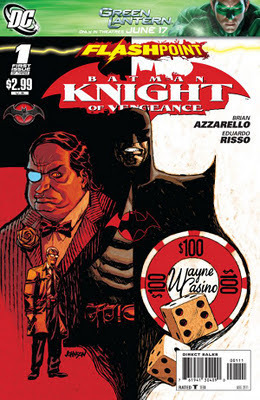 Of course, retailers should carefully gauge interest so as to not negate that "bonus" the variant editions provide. If one must order two or three extra copies of the book in question to snag one variant, easy peasy. If it's another 20 or 30 copies, not worth it. Recently, there have been new variant covers meant to attract a niche audience. I'm talking about those "blank" covers. You've seen them at conventions. Fans buy them because they can get a sketch on them by their favorite artist. Artists buy them because they can draw on them and sell them for big bucks on eBay. It's all the next stage of the big ruckus caused by the Hero Initiative's "100 Projects," where creators were given blank editions to draw on, with the finished editions auctioned for charity. When you have a whole part of your industry propped up by incentive variants, and retailers buy more copies than they can sell in order to appease that rabid fan who has to have that 1-in-200 edition, well, you can see how "not good" for the industry it is, right? But onward we go, from the cover to actual content, or lack thereof. In 1977, independent comic creator Dave Sim practically invented the fixed-length series with Aardvark-Vanaheim's Cerebus the Aardvark, a work planned to be 300 issues. Two years later, DC Comics made its first foray into the same concept with a notably shorter work: the three-issue World of Krypton series. Over the years, the big two publishers increasingly embraced the new format. Everything changed in 1982, when Marvel published Marvel Super Hero Contest of Champions, the first event featuring a large gathering of a company's characters. Super Powers (by DC) and Marvel Super Heroes Secret Wars came in 1984, each buoyed by a line of popular children's toys. Soon, the big two scheduled regular events, consisting of either a "miniseries within a series" or one core miniseries with a number of satellite stories told in other, regular series. The idea was simple: if your favorite book featured a crossover to the company's big event, then you might just check out that event series, and that event series might feature another character you never read before, in which case you'd rush out to buy the new issue of their series. The limited series only increased in importance over the intervening decades, and is now the primary means of telling stories in the medium. 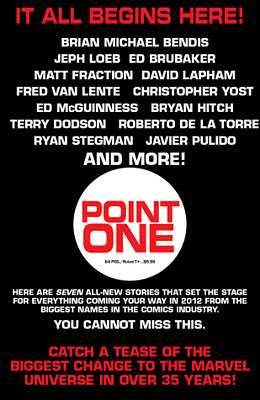 Events such as Secret Wars and this year's FlashPoint and Fear Itself are just the tip of the iceberg. 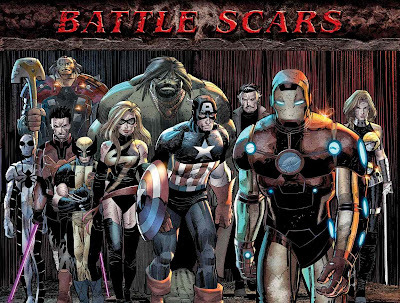 They've become so popular that, ever since Joe Quesada became editor-in-chief of Marvel in 2000, the single-issue story has become a dying art. Maybe it was the assertion of artistic talent over the importance of writing--the perpetuation of the movement begun by Image Comics in 1992 which placed the artist squarely above the writer. Maybe it was the realization by editors that if you could hook readers for four or six issues instead of just one, you stood a better shot at increasing overall readership. Or maybe it was all about altruism, about "letting the story breathe." The size of the panels in the average comic increased, the number of panels per issue decreased, the number of words per panel plummeted, and the number of thought balloons became nonexistent. The new age of comics had its champion in Brian Michael Bendis, author of Marvel's new series, Ultimate Spider-Man. It was a grand reimagining of the company's most popular hero, just in time to inform a major motion picture by Sony Pictures. Bendis, once a minor player at Caliber and later Image Comics, on his own Jinx as well as the Spawn spin-off Sam and Twitch and other books, soon was everywhere at Marvel, writing the first book in the MAX "mature readers" imprint, Alias, as well as the mainstream Avengers book and other series. He's penned three major crossover events since 2005 (House of M, Secret Invasion and Siege). He currently remains chief architect among the Marvel Universe in general, and the Avengers brand in particular. 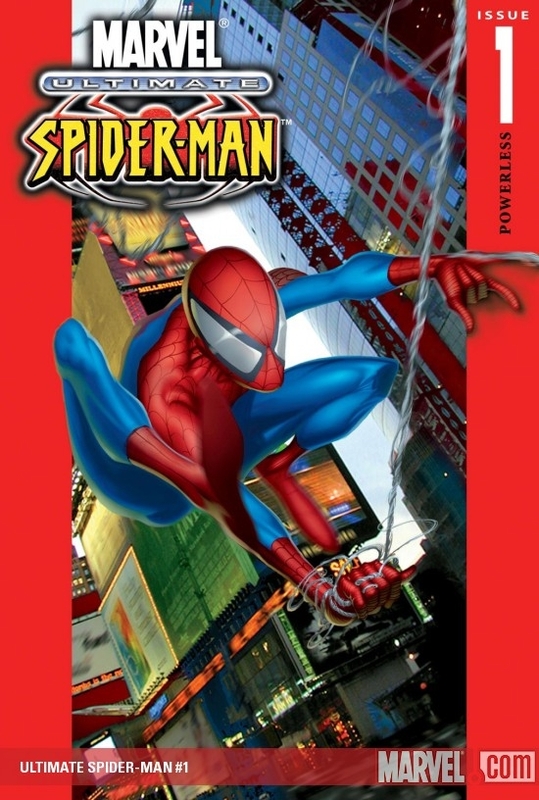 As they say, "Imitation is the sincerest form of flattery," and so the new management at Marvel, seeing early sales success with Bendis' Ultimate Spider-Man and Alias, and Mark Millar's The Ultimates, quietly proliferated this new "decompressed" storytelling method throughout the "new" iteration of the company. Before long, everything was "Part X of Y," ready to be easily collected in graphic novel collections that were no longer reserved for the "best of the best" that the company had to offer. 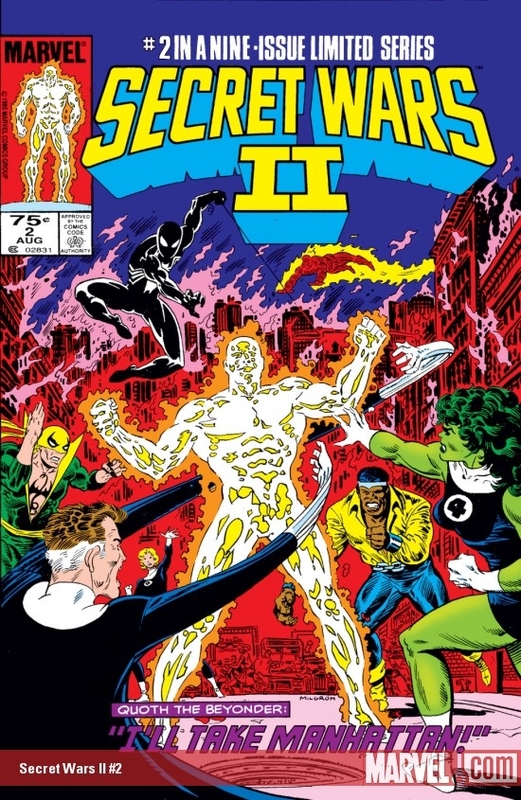 Every story forwent the conventions that stated characters' names, powers and situations had to be recapped early in any given issue; instead, often-dense text pages opened each Marvel comic, which could then be omitted from the collections and "preserve the flow" without resorting to "clunky exposition." So, with the conventions of the medium being abandoned left and right, and with Bendis and Millar's style of writing a single storyline across multiple issues all the time fast becoming Marvel's house style, what could happen next? Enter the apotheosis of the "new" Marvel: Fear Itself. A series designed merely to sell other books where the "real" events occur. Oh, Marvel's been playing around with the format. Several events over previous years have consisted of one central miniseries supported by a combination of crossovers in ongoing series and specially-constructed tertiary miniseries and one-shots. DC even did them one better this year with FlashPoint, a whole event constructed almost entirely from various miniseries. And they've released one-shots after the conclusion of big events, which consisted of various tales related to the just-finished event which in turn spun off into their own series of varying length. In Fear Itself, the well-oiled machine has come out to play, courtesy of writer Matt Fraction and artist Stuart Immonen. It's clear the event was meticulously planned. So clear, in fact, that to a superlative degree it's "by the numbers" comics. Except, of course, that virtually every important event occurs outside the main title. Don't believe me? True, Bucky Barnes died in the main series. If you've read the final issue, you'll know somebody else died at the hands of the Serpent--but of course he's due to return because Fraction also writes his ongoing series. Ask yourself: Did you see every one of "The Worthy" find his or her hammer in the main series? Did you see many of the major characters in the series formally introduced to readers outside of the text page in the front of each issue? Did Red Hulk do anything more than look dumb in the first and seventh issues of the series, without being referred to by name? Were any of "The Worthy" other than Sin and the Thing shown having their hammers taken away? And what about Nul's appearance in the Defenders preview in the back of the last issue? If you didn't read many of the tertiary tie-ins in books like Hulk Vs. Dracula or Fraction's own Invincible Iron Man, you'd be totally lost as many key plot points were only shown outside Fear Itself proper. Heck, the Hulk didn't even appear anywhere for more than a panel or two in the last two issues, and yet, we get two epilogues devoted to him in that final issue. Really? Don't tell me that there wasn't enough room in the seven-issue core series to show all of the above events. Just don't. If Jim Shooter could jam-pack all the key plot points into the nine-issue Secret Wars II series and make all the tie-in issues entirely optional, then why couldn't Fraction? There is only one reason why several key plot points were left out of the main Fear Itself series: Marvel wanted to sell more comics. And they still want to sell more comics. Or hadn't you noticed that the ending of the event is bookended by four multi-page previews of upcoming series like Defenders and Incredible Hulk? They've finally taken out that step of having to buy a separate book to get previews of the new, "hot" series coming your way in the following months. Oh, wait. Except they didn't do that at all. 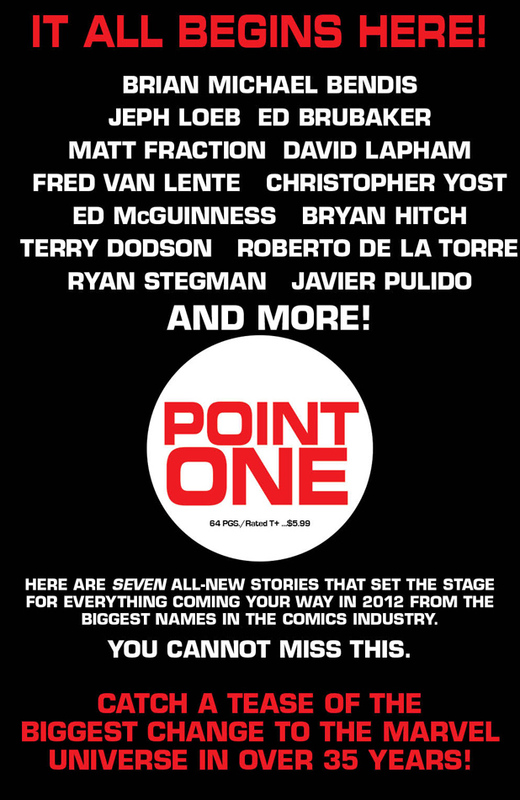 Marvel Point One is still on-schedule for next month, with previews of several series including ones already previewed in Fear Itself! And just as there are truly new series coming up, Marvel has also taken the opportunity to cancel and relaunch books like Uncanny X-Men and Incredible Hulk in the aftermath of these big events. First issues have, then, become another crutch for the industry. Just like at DC with their "New 52," a first issue beats working hard to make individual issues accessible. It's a cheat designed to make people look. This book gets canceled, that book gets replaced! This series launches these others over here! Brilliant marketing strategy...for those who already read the books. For those just trying to get into the hobby? Not so much. Look! First issues! Variant covers! More first issues! Previews! Collections released before the ink dries on the single issues! Woo! Shiny! Pay no attention to the man behind the curtain! I hope all of you can see just what has happened in this age of "decompressed" comics. We have events that infest multiple titles and distill their most important events across them. We have characters never introduced except in first issues of increasing frequency, and sometimes not even then. We have stories that are best read in big graphic novel collections instead broken into bite-size chunks. We have readers dropping books because they don't like a certain character and don't want to read through the next six issues of a series knowing that character will be there. We have page after page populated with Photoshopped copies of the same few panels as characters talk back and forth when they should be hitting each other. We have constant violations of "show don't tell" while in other books artistic styles run rampant because it's cool to have several double-page spreads of your characters without advancing the plot. We have entire books where new readers might ask, "Who the hell are these people?" We have a non-stop culture of events, often with several "big," "important" stories all being released simultaneously, each of which all but requires multiple purchases to understand. We have stories that could take up less space, leaner and meaner, instead bloated to fill collections that render collectability of single issues virtually obsolete. When did it become cool to have the new issue of a book that costs four whole dollars take all of two minutes to read? Unfortunately, like with the pricing issue, it's difficult to put the genie back in the bottle when it comes to "decompressed storytelling." 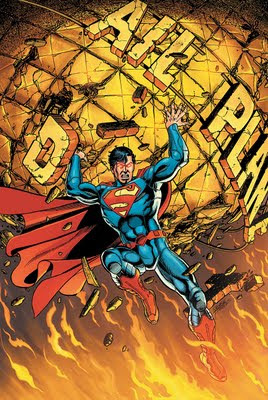 If you don't believe me, take a look at the overly-packed Superman #1 by George Perez and Jesus Merino, released just a few weeks ago. While you can argue that most of the dialogue across the whole issue just wasn't very well-written, it seems like a knee-jerk reaction more than anything when all reviewers out there made it their mission to tell fans that, by gum, there's a lot of reading to be done in that book! By contrast, just take a look at Fear Itself. Most pages didn't have more than thirty words. Not panels--pages. But ooh! Look! Art! Pretty! Did I say I was reviewing Fear Itself #7? that was a nice talk. there's a lot of digging to be done in comics. Still plenty of gems out there, sweet tooth comes to mind, but of course that's not a superhero but sci-fi for sure, and as you know Lemire is writing Animal Man, which did have a nice number of words in it, and panels and, you got animal man right? 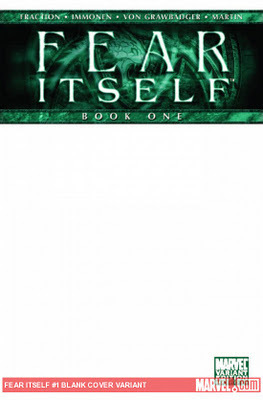 i got the first issue of fear itself, and was bored by it, so i never got the rest, especially after seeing half the comic rack from marvel filled with tie-in issues and seperate mini-series, i find myself completely uninterested in the mess of them. also, if i got to the used book record store an hour drive away they always have scads of comics from the past year for fifty cents. I got all of world war hulk that way and a few of it's associated sideline miniseries, and found the form really dull, like stretching out thin ideas to their most boring point, and finding them in the 50 cent bin drove that home even further. But i will tell you, if you read the secret invasion 1-7 or 8 or however many issues are in the core title, by Bendis, you will see that the ending is a trick. All the sudden after everything else they find a secret way to identify Skrulls after find themselves totally unable to detect them by any technological, magical, psychic or physical means, nobody could tell who was a Skrull, even the Skrulls themselves did not know what they were. And then right at the end, they find this special way. Right. Brian Michael Bendis himself. Also it is rumored he is the secret seventh member of Bone Thugs & Harmony. I would LOVE to see Big Jim Shooter back as Editor-In-Chief at Marvel... my god, his blog is fantastic reading! 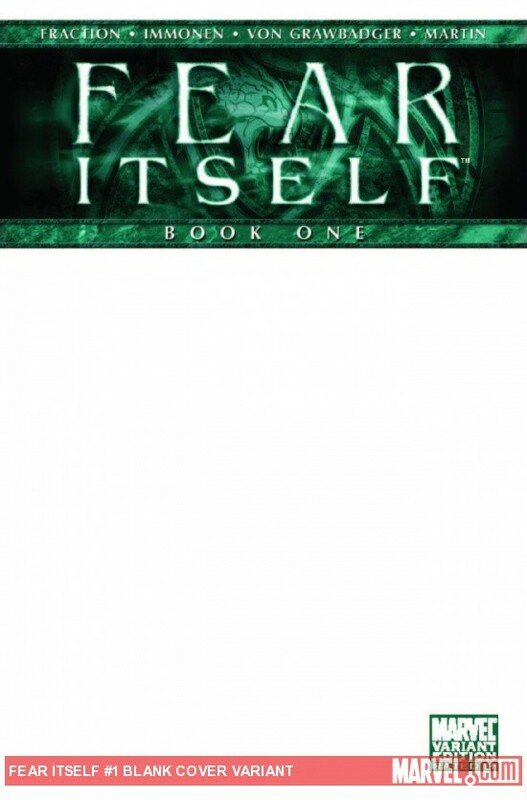 Fear Itself, was on the whole... awful. What happened to the Hulk? I know, his tale was told in the Hulk vs Dracula series, which I didn't pick up because I'll be honest the art wasn't my cup of tea. But I didn't want to buy the spin-off series anyway to continue the story, which is what Marvel is in essence making us do. I want to be able to read the complete tale in that particular series. Bucky was killed off in this series in a VERY underwhelming manner. Didn't see much reaction to it either from Cap and co. And a certain character was killed off in this last issue? My reaction? Zilch... means nothing these days. They'll be back. Bucky probably will as well (that character, if his demise was always meant to be as I believe Ed Brubaker stated recently.. should have, and deserved to happen in the main Captain America title.). Again, it means nothing. And the problem with Marvel these days is that every big event, or new 'hot' title is written and drawn by the same creators.... either Fraction, Bendis or whatever. So we're going to get the same every time (and why does EVERY single new issue 1 have a Joe Quesada variant cover?) Marvel Achitects? Pfffft... give me a break please. Why isn't Greg Pak on that list? He certainly deserves to be, after the awesome run he's had on the Hulk. 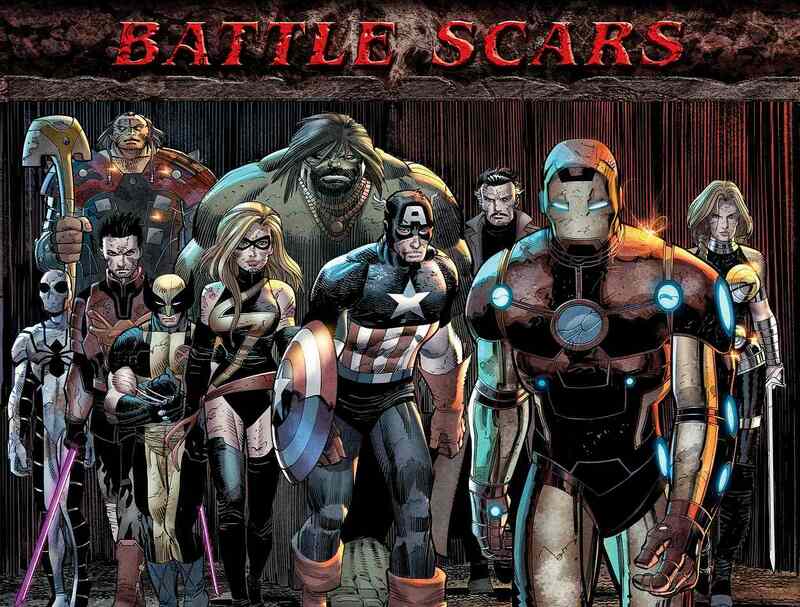 There hasn't been one event, aside from World War Hulk that Marvel have done in recent years that matched the excitement that the original Secret Wars generated. Each issue of that was like a self contained epic. I can't comment on the quality or lack thereof of Fear Itself, as I had no interest in it from the start, but for all disillusioned comics readers, I have advice that has served me well the past couple of years: read what you like, don't read what you don't like, and let the chips fall where they may. Comics companies, no matter who they are, are not going to change the way they do business. Vote with your dollars. And if the companies are still doing practices you don't approve of after you take my advice, it simply means there are more readers out there who don't mind how the publishers do business. Ultimately, don't blame the publishers--blame your fellow readers. I meant to assert this in one of your Greg Pak posts and to an extent I did. He wrote many issues of Incredible Hulk but how many different distinct Hulk stories did he tell? Chris, good point. To start to address your point, remember that Greg Pak has written more issues of the Hulk than anyone with the exception of Peter David (IIRC). That includes 81 total issues of regular and miniseries. That said, how many actual "stories" did he actually write? How many arcs? My only gripes with Greg's style is that in some cases, he'll under-write scenes or leave out important bits of information. I realize sometimes readers have to draw their own conclusions and not be spoonfed. I also realize there's a terrific, tragic poetry to monologues for, say, the Hulk. I'll again refer to "World War Hulk"--in particular issue #3--as well as the recent "Heart of the Monster" arc for standout examples where we really, truly needed some more narrative captions to texturize events. We've got "Planet Hulk," that's one. "World War Hulk" is two. I'm not sure how many parts you want to count the stories in "Incredible Hulk" that crossed over with WWH. "Skaar: Son of Hulk" had three main arcs over its run. Each of the first five issues of the new "Incredible Hulk" was self-contained. Lump "Fall of the Hulks" and "World War Hulks" as one story. "Dark Son." "Chaos War." "God Smash." "Planet Savage." "The Spy Who Smashed Me." "Heart of the Monster." "Warbound." Round it off at 20 stories Greg Pak's actually told featuring the Hulk. But as I stated, many of his single issues did have beginnings, middles and ends, and that's more than compared to many of Marvel's writers like Bendis, Millar, etc. Many could stand on their own. Trust me, it actually made me angry when people compared Bendis's body of work on Ultimate Spider-Man with Stan Lee's on the Amazing Spider-Man. The artist may have drawn more pages (less panels) than Ditko but in 100 issues Bendis did not write as much as one fifth as many stories. I believe Pak did WWH: X-Men and a couple others. Don't forget The List, Amazing Fantasy 15, of anything that could be considered its own story inside an arc. I think Planet Hulk had one or two of those, right? You won't get any disagreement out of me about Fear Itself. The plot was thin to begin with and when you hack off all the most significant moments and spin them out into a million tie-ins, you're left with a shell of a comic. A very weak outing. But I can't agree that Fear Itself is indicative of all modern Marvel fare. Like Fear Itself, World War Hulk was a major crossover with a dozen tie-ins. But the main mini series was almost entirely self-contained and had great moments throughout. World War Hulks could be read almost entirely by buying Hulk and Incredible Hulk and a lot happened in each issue, and we even got some of the strongest Jeph Loeb Hulk stories to date. Good events can be done and have been done by the same leadership currently at Marvel. Chris: Christos Gage wrote WWH: X-Men. "Planet Hulk" actually had 4 arcs inside it, though I'd really count them as one bigger arc. I was counting DARK REIGN: THE LIST. Nate: We have come four years from WORLD WAR HULK. True, Greg Pak and Mark Paniccia went out of their way to make that event accessible. Other editorial teams that have structured events since haven't done such a good job. SECRET INVASION, SIEGE, and now FEAR ITSELF all have had a structure where the writers and editors (Tom Brevoort, I'm looking at you!) all presume readers have already read other books and make little effort to draw in casual readers. In addition, said events have bridge events like "Dark Reign" and "The Heroic Age" which have no central series as a "spine" but which encompass dozens of books if for no other reason than to sell more comics precisely because they all fall under the same umbrella title! Again, smart marketing but dumb comics--and dumb readers for slavishly picking up everything under that umbrella. Paniccia? Good work on coordinating events. Wacker (SHADOWLAND)? So-so. Everyone suffers from event bloat, but the question is, can you read the core series and still get the gist? Brevoort? Worst offender. By far. I did not read Secret Invasion or Siege (at that time I was essentially only reading Hulk's books), so maybe there is a pattern of bad event writing (but I can't say firsthand). But at the same time....Spider-Island in the Spidey titles seems pretty straight forward and you can follow the entire story from ASM alone. Maybe Marvel just does better with with these character-centric events rather than universe-spanning ones. Maybe it's Tom Brevoort, or maybe it's not. Tom has been around a lot of years and the product he has put out has been so varied. If I recall correctly, Maximum Security (remember that!?) 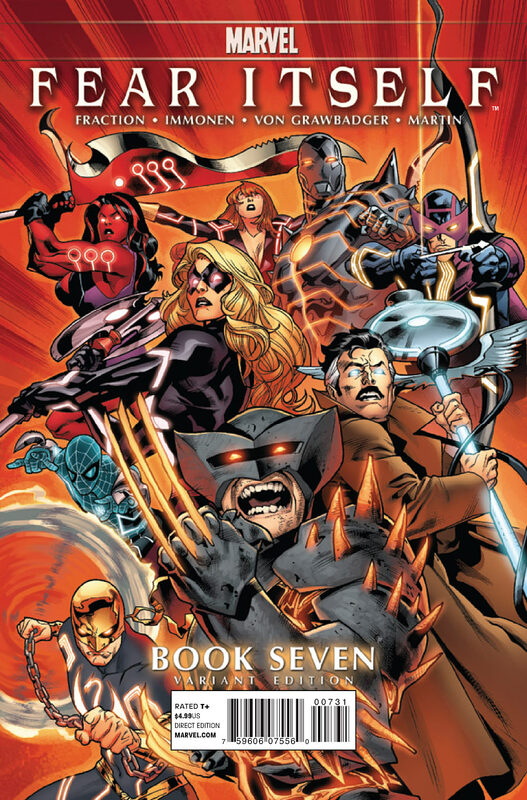 was pretty easy to follow from the main title and Avengers, so was House of M and Civil War. But if out of a nonsensical story like Fear Itself we get some good books like TIH and Defenders, then maybe it's not a wash.
Christos Gage. Right. Mea culpa.